There is no doubt that my favorite time of year is Summer. I have loved the warmth of the summer since I was a child. That combined with having my children around makes the summer my favorite time of year. In fact, I would love to live in a location that had Spring, Summer and Fall and no Winter! Funny given my sons play hockey, the ultimate winter sport. One of the things I enjoy most about the summer is the opportunity I get to observe a very active Osprey nest in Westhampton Beach, NY. 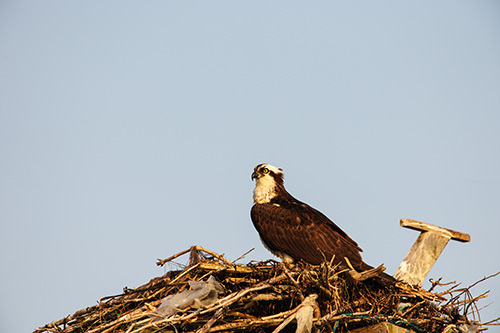 There are several nesting platforms that have been provided by The Group for the East End, an environmental advocacy group that operates on the east end of Long Island, NY. They have provided 60 nesting poles that mimic the dead trees that Osprey usually love to nest and perch in. They are in the process of identifying locations for another 40 poles! Early in my research time with Osprey, I realized that being harassed by blackbirds is a common occurrence for Osprey. Its strange to think that a predator has such a small nemesis. The location of this nesting pole is in a marsh. Red-winged Blackbirds have nests in the swamp so they are plentiful in this location and chase the Osprey all day long, in the nest or during flight. 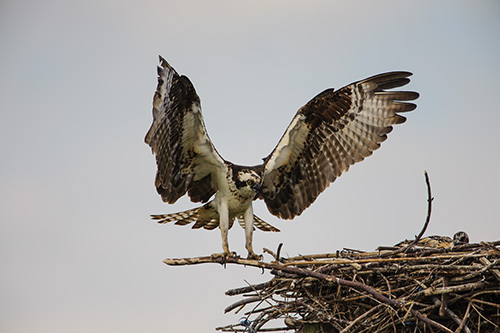 One of my favorite observations is that of the Osprey returning to the nest. Photographing them at the peak of action enables you to capture tack sharp images. All of these images were made at sunset. What a delight it must be to watch these handsome birds all summer long. Fabulous photographs! Thank you both very much. Yes, Julie, it is one of the things I enjoy the most about the summer. They are very interesting birds. I might be losing my viewing location to development in a year :-(. Vincent, that last photo is outstanding! And I live in the place you describe! Believe it or not, we do have autumn here and once in a great while a brief dusting of snow! Come on down! 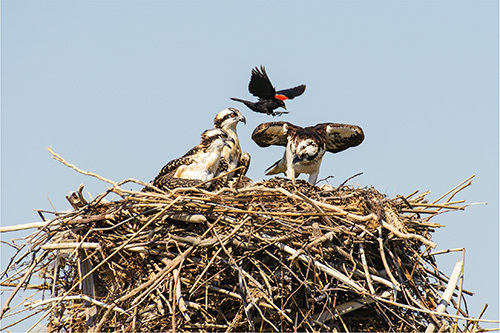 Love the shot of the Red-winged Blackbird attacking the adult Osprey while the young ones look on. What a fierce foe! That Red-winged Blackbird sure looks determined! Thank you all for the comments. Kathy, I might take you up on the offer, I have not birded much out west, its on the bucket list :-).